-44 pieces in two rows packed in leather bag.Every piece marked with its own size. -22 pieces in silver color and the other 22 pieces in the colors as picture shows. 44 pieces in two rows packed in leather bag.Every piece marked with its own size. 22 pieces in silver color and the other 22 pieces in the colors as picture shows. If you have any questions about this product by WZT, contact us by completing and submitting the form below. If you are looking for a specif part number, please include it with your message. 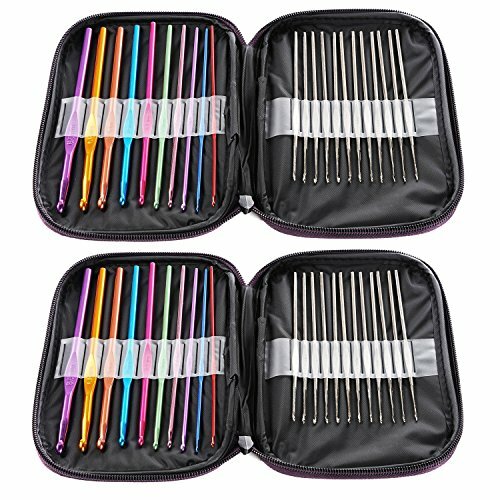 Wonder Art FROSTY 12" x 12"
Sparkling Pumpkin 36pcs Crochet Set - Ergonomic Crochet Hook Set with Multiple Accessories – Green Floral Hook Case, Yarn Needles, Stitch Markers, Measuring Tape, Yarn Snips & More!